It could be argued that of all Studio-Era stars, Judy Garland is the one that continues to be most present in the culture; most seen and heard, most discussed, indeed so much of a reference point that we might take her presence for granted. Every Easter we see her in Easter Parade with Fred Astaire; every Christmas it’s ‘Have Yourself a Merry Little Christmas’ in Meet Me in St. Louis; not a year goes by where we don’t have an opportunity to see The Wizard of Oz, recently even in Cinemas and in 3-D. Her death in 1969 was said to have sparked the Stonewall Riots, the subject of one of this year’s great flop movies. She’s a gay icon. 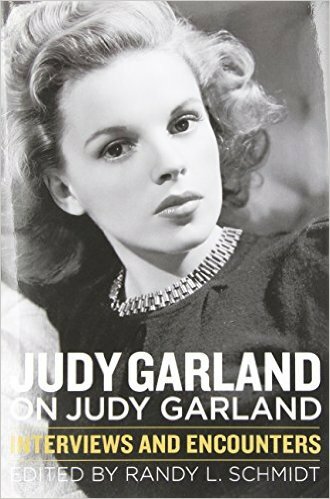 But the obsession with her life and career is, as Susan Boyt so movingly demonstrated in the excellent My Judy Garland Life (London: Bloomsbury, 2009), not limited to gay males d’un certain age. End of the Rainbow, a musical show about her life, is still touring after its debut in 2005, and Tracie Bennett won the Tony for her performance in the play in 2012. This year, Lorna Luft, the other Garland daughter, has been touring the UK in The Judy Garland Songbook and Variety just announced that The Judy Garland Show, which ran for a short time in 1963 and 1964, would, with The Merv Griffin show, anchor the new Talk-Variety block on Get TV. All the above is a context as to why I was so eager to read Judy Garland on Judy Garland: Interviews and Encounters. In the back cover of the book, Sam Irvin, author of Kay Thompson: From Funny Face to Eloise, tells us, ‘The Holy Grail for fans of Judy Garland! Randy Schmidt is the Indiana Jones of Garland archaeology. Never before has Judy been given such laser-focused spotlight to speak for herself – and like her greatest musical perofrmances, she takes center stage and wows us with every phrase.’ After reading the book, my first thought was, ‘who does Sam Irvin think he’s kidding’? The book is composed of interviews garnered from radio, the fan magazines, newspapers and later television. They’re organised by decade. The first two deades are clearly studio stage-managed. Thus in the 30s we get a lot about how Judy’s stuck ‘In-Between’, the title of one of her great hits of the period, where she’s not yet a child but can’t quite go on dates. The forties are very much a way of stage-managing the public reception of her love life; mentions of Artie Shaw and then her elopement with David Rose, her subsequent marriage and divorce with Vincente Minnelli and the birth of Liza. The fifties are only partially covered and we only get slected interviews mainly from the fan magazines until 1955, thus covering the period where she was fired from MGM to the moment just after the release of A Star is Born. The Sixties is expectedly necrophiliac but covers a greater diversity of material, including excellent interviews with Art Buchwald and a transcript from a superb interview with Gypsy Rose Lee on TV. On the one hand, it’s great to see these collected in one volume. On the other, most of them are quite readily available and the ones culled from TV or radio would be so much better to listen to or watch that one feels disappointed. One doesn’t really begin to hear her ‘voice’ until the sixties, though there are some hints in the 50s material as well. There’s no question that this is rich source material; and that Randy L. Schmidt has done a good job of collating it together. But reading through the material one wishes someone had offered an analysis or more of a context for each of those periods covered as it raises a lot of questions and answers none: Are Mickey Rooney and Judy Garland the key popularisers of the concept of the teenager in the twentieth century? ;How did what Garland mean evolve throughout the 40s? Is anything Garland did in the 50s different to what Sinatra did and is the differing ways they were imaged and publicised not a continued marker of an oppressive sexism? How could someone who worked at that pace across so many media and into middle age in the Sixties avoid drugs and alcohol when much younger people in that decade were much quicker to succumb? How could someone who never stopped working and always earned top dollar never have any money (i.e. were Freddie Fields and David Begelman, her managers in the sixties, thieves?} These are the questions the book raises, though it is perhaps unfair to expect a book of this kind – a collection of interviews – to answer them. I nonetheless wish someone would. Thus a good collection of interviews, with quite a lot of repetition amongst them, less context and analysis then one would have hoped even within the scope of such a book, and ultimately a disappointment.